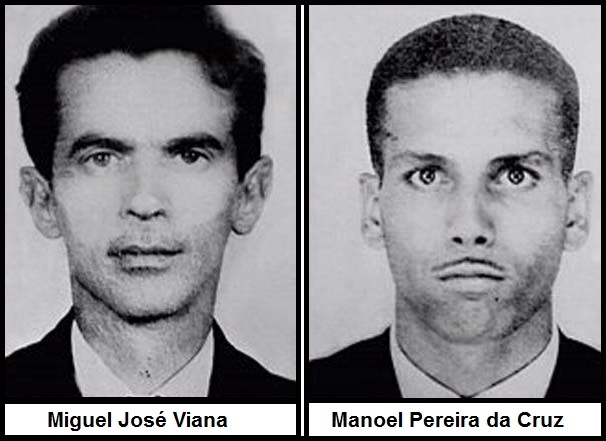 On the afternoon of August 20, 1966, a young man was flying a kite on the Morro do Vintém (Vintém Hill) in Niterói, Rio de Janeiro, Brazil, when he came upon the bodies of two deceased males and reported them to the authorities. The Morro do Vintém had difficult terrain, and the police were unable to reach the bodies until the next day. When a small team of police and firefighters arrived, they encountered an odd scene: the bodies rested next to each other, partly covered by grass. Each one wore a formal suit, a lead eye mask, and a waterproof coat. There were no signs of trauma or any evidence of a struggle. Next to the corpses, police found an empty water bottle and a packet containing two wet towels. A small notebook was also identified, on which were written the cryptic instructions, "16:30 estar no local determinado. 18:30 ingerir cápsulas, após efeito proteger metais aguardar sinal mascara" ('16:30 be at the specified location. 18:30 ingest capsules, after the effect protect metals await signal mask'). The two men were identified as Manoel Pereira da Cruz and Miguel José Viana, two electronic technicians from Campos dos Goytacazes, a town several kilometers to the northeast of Rio de Janeiro. Following an investigation, police reconstructed a plausible narrative of the men's last days. On August 17, Cruz and Viana left Campos dos Goytacazes with the stated intent that they needed to purchase some materials for work. The two men then boarded a bus to Niterói, and arrived at 2:30 pm. Evidence shows that the waterproof coats were purchased at a shop there, and one bottle of water from a local bar. Upon being interviewed, the waitress from the bar described Miguel as "very nervous," and noticed he frequently checked his watch. That is the last time they were known to have been seen alive; it is presumed they went directly from the bar to the spot at which they were discovered. No obvious injuries were discovered at the scene, nor later at the autopsy. A search for toxic substances did not occur. The coroner's office was very busy at the time and, when the autopsy was finally conducted, the internal organs of the two victims were too badly decomposed for reliable testing. UNPLEASANT FACT: Some tumors can grow teeth, be filled with hair, or develop organs of their own. On February 24, the skies of Los Angeles were lit with anti-aircraft artillery fires. The target: an unknown aircraft, thought to be an enemy. This spectacle is known as the Great Los Angeles Air Raid. The “battle” lasted for several hours from late February 24 to early February 25. Some theorized that the aircraft may have been from an extraterrestrial source. Flying from Denver to NYC, about 30 seconds after the plane leaves the ground the left engine explodes (likely a bird they said). I'm pretty calm, but start getting freaked out when I notice the stewardess are all crying. Completely freaked out when we are getting close to landing and there are firetrucks all up and down the runway, and the runway we are landing at is way the hell away from the terminal and everything else.